Program Brokerage Corporation (PBC), is a powerful market resource for brokers and agents, we are also a partner for carriers reaching out to the commercial insurance buyer in innovative, cost-effective ways. We’ve pioneered an innovative approach to Purchasing Group Insurance buying, which has won popular acclaim. With over eight decades of experience, the experts at Weisburger truly understand your business and your specific insurance needs. 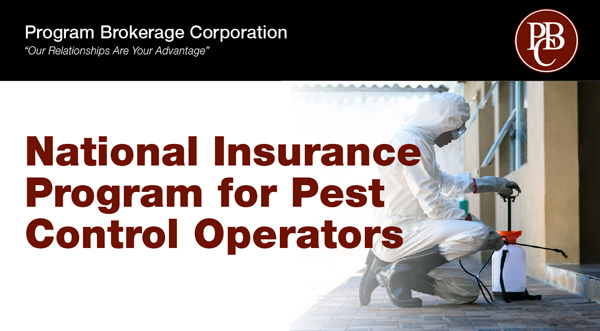 As the largest provider of insurance solutions to the pest control industry, we put together comprehensive, cost-effective programs tailored to the needs of your business and employees. Auto, Workers’ Compensation and Umbrella coverages also available. "Our Relationships Are Your Advantage"
Do not reply directly to this email.